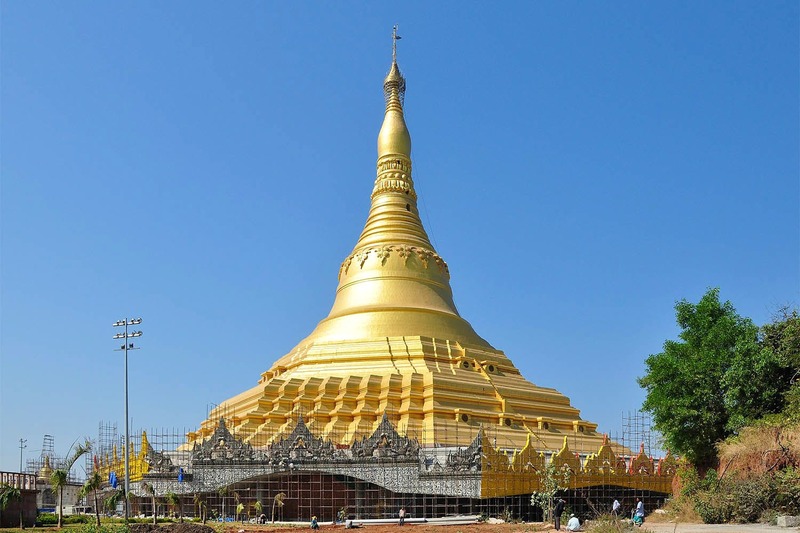 Pagoda temple, also called the Global Vipassana Pagoda, is a meditation centre that also hosts Vipassana courses, and is the place you could use for some peace and quiet. Inaugurated in 2009 by the then President Pratibha Patil, Pagoda is built on a donated land using generous donations and is a monument of peace, harmony and tolerance. The Pagoda is also a mark of gratitude to Sayagyi U Ba Khin, the Burmese Vipassana teacher instrumental in bringing Vipassana back to India. The Pagoda is open for visitors from 9 AM – 7 PM through the week without any entry fee (even the guides take you around for free), and there’s a lot to see. Except for the Dhamma Pattana, where the 10-day course happens, every other place is open for visitors to see. The Ashoka Pillar is a beautiful lotus pond with a fountain that signifies the presence of dharma in all directions. Then there is Gate no. 1 – a majestically carved Myanmar teak door, wall mountings that explain Vipassana, a 17-minute video which takes you through the benefits of Vipassana, a painting gallery, a Buddha statue, a gong tower (a Burmese design with devas to announce the spread of dharma), and finally the bell tower – stroked at the exit to spread compassion. Once you get tired, there is also a food court for refuelling, and a books and souvenir centre to bring back some tokens. It’s 42 km from the airport and can be reached by road. If you’re a hustler who is okay taking the local, then we recommend you get off at Malad station, make your way to Marve beach and take the Essel World ferry service, disembark at the Essel World jetty, from where the Pagoda is just walking distance. If your leave count looks scarily low, and work is driving you up the wall, take this quick break and visit the Pagoda for some peace. Who knows, you might just find your enlightenment.